The 1996 medieval fantasy adventure will swoop down on Blu-ray this March. 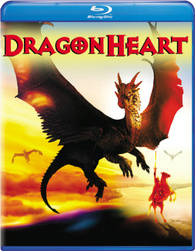 In an early announcement to retailers, Universal is working on 'DragonHeart' for Blu-ray on March 27. The film is about a knight (Dennis Quaid) who must form an unlikely allegiance with the land's last dragon (voiced by Sean Connery) in order to end the reign of an evil king (David Thewlis). The Blu-ray will feature a 1080p video transfer, a DTS-HD Master Audio 5.1 soundtrack, and supplements will include: The Making of Dragonheart featurette, My Scenes and Pocket Blu. You can find the latest specs for 'DragonHeart' linked from our Blu-ray Release Schedule, where it's indexed under March 27.